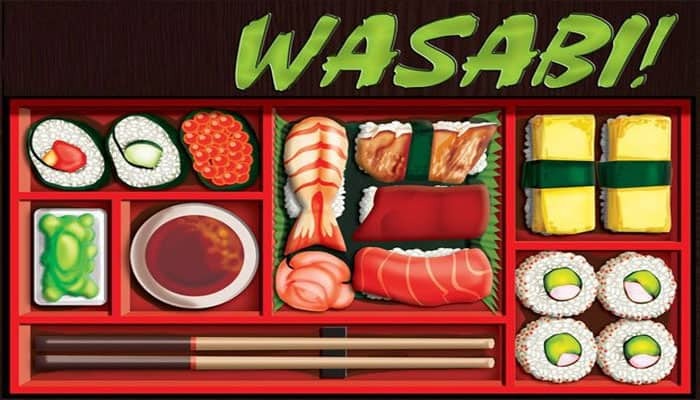 Wasabi! is a light and fast game where you compete against other players to assemble your quota of unique sushi recipes in a rapidly dwindling space. Players draw a variety of delicious ingredients into their hand from the pantry and play them one at a time onto the board, building off of each other's previously-placed ingredients in the attempt to complete recipes of varying difficulty. Completing a recipe earns you your choice of special actions from the kitchen to perform later (Chop!, Stack!, Switch!, Spicy!, and the dreaded Wasabi!) that will help you in your efforts or disrupt your opponents' carefully arranged creations-in-progress. Completing a recipe with style will earn you bonus points, but you might not always have the time to set up such stylish maneuvers... balancing speed with technique will be crucial if you plan to win the game! Victory comes as soon as the board fills up with ingredients. Points for completed recipes plus bonuses are tabulated, and the winner is the player with the most points. An extremely skilled player might score an instant victory by completing their quota of recipes before the board fills up. You are an apprentice to a great sushi master, and you have spent the last ten years honing your skills in preparation for this day- your final test before earning the title of expert chef Itamae-San. Sushi is about culinary expertise, and you must always strive to master your skills while serving an array of vivid colors, mouthwatering tastes, and creative combinations. 'The test will be difficult. There are 5 different types of Action Cards: Chop!, Spicy! 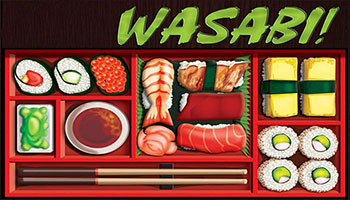 Switch!, Stack!, and the dreaded Wasabi!. You start the game with no Action Cards, but earn them by completing Recipes. When you play an Action Card on your turn (maximum 1 per turn), you can take advantage of its special ability.